eD@HoMe: My Latest Catch On eBay! My Latest Catch On eBay! Sharing with you guys today are four beautiful hand painted FDCs (a.k.a. cachets) by Fred Collins. 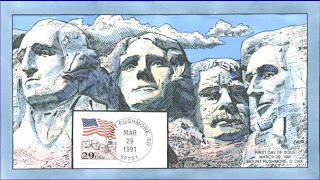 Voted 'Cachet maker of the half century (1951-2000)' by members of the American First Day Cover Society, Fred Collins has been producing superb quality cachets since 1978. Each and every Collins cachet is individually handed painted in beautiful watercolors. Brush stroke after careful brush stroke brings each cover to life, and they truly are miniature works of art. You have to see them to believe it! 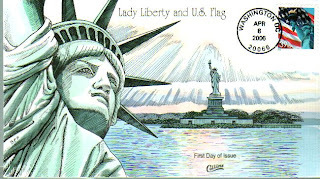 The stamp affixed on this 'Lady Liberty and US Flag' cachet was issued on March 8, 2006 from the 'National symbols' series. Dedicated on Oct 28, 1886, the Statue of Liberty was a gift of friendship from the people of France to the people of the United States and is a universal symbol of freedom and democracy. Next, Collins used a Mt. Rushmore stamp from 1991. 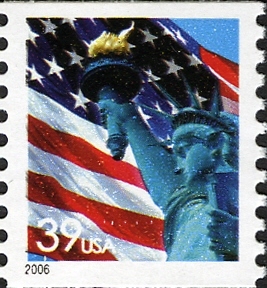 This stamp was another in a long-running series of definitives that showed the American flag waving over a national landmark. Located in South Dakota, at the foot of the Black Hills, Mt. Rushmore is crowned by gigantic carvings the heads of four U.S. Presidents: George Washington, Thomas Jefferson, Theodore Roosevelt, and Abrahim Lincoln. This massive project was begun in 1927 and was not completed until 14 years later, in 1941. The stamps used on the third and fourth cachets are from the 'The Art of Disney - Friendship' series. 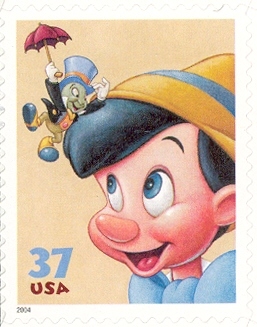 Issued on June 23, 2004, they illustrate 'Pinocchio' and 'Bambi' respectively. 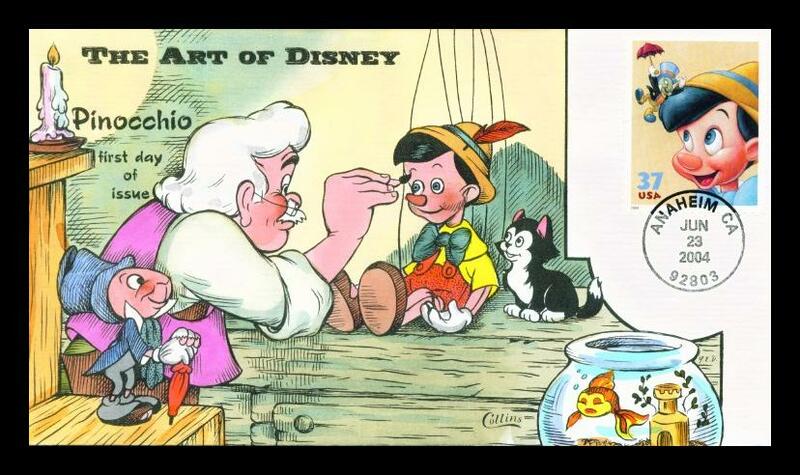 Pinocchio is a 1940 Walt Disney's animated film. The story involves an old wood-carver named Geppetto who carves a wooden puppet named 'Pinocchio'. Brought to life by a blue fairy, Pinocchio was told that he can become a real boy if he proves himself "brave, truthful, and unselfish". Thus begin the puppet's adventures to become a real boy, which involve many encounters with a host of unsavory characters. 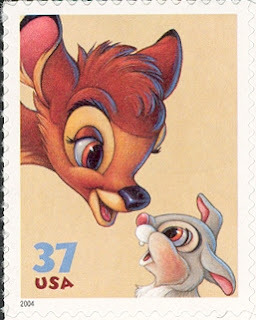 Bambi is a 1942 American animated film by Director David Hand. 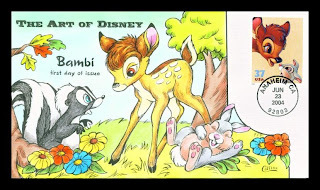 In Disney's spectacularly animated forest fable, a fawn named Bambi is born, destined to become "Prince of the Forest." He soon befriends other woodland creatures such as Flower, a bashful skunk, and Thumper, an outgoing rabbit. As the years pass, they encounter a number of life's lessons in the woods, including the death of Bambi's mother at the hands of hunters. 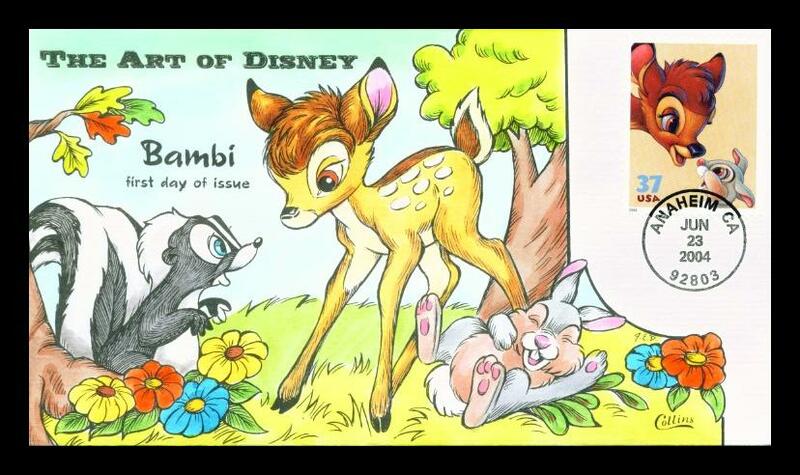 Eventually, Bambi comes of age, completing the cycle of life and taking his father's place. Based on the classic novel by Felix Salten, BAMBI demonstrates the strength of family values and camaraderie. Director David Hand adds a mixture of great songs and life-like backgrounds to make this early Disney film an unforgettable film classic for all ages. We'll end this posting with a visit to the Disneyland! Beautiful. Are they all hand drawn and painted? or just painted? The Disney ones are so cute. 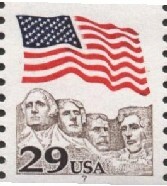 There should be 2 more stamps to this set. DID YOU GET MY LONG ENVELOPE ( sent from Brussels on 27 AUgust!!! )with 8 Buzin Bird stamps and two other stamps??? I guess you didn't as you never published it which means it was lost or stolen between Belgium and Singapore : I guess my wish of a beautifully stamped Singapore cover in exchange will never come true!? A Registered Cover From Mexico! Battle of Rozhanovce Cover From Slovakia! My First Cover From United Nations, NY! Sinhala New Year Cover From Sri Lanka! 'Trillion Dollar' Cover From Korea! Giant Panda Stamps From Singapore! An Awesome Cover From USA! A Lovely Cover From Serbia! 2 Beautiful FDC from Taiwan! !